Just back from a lovely walk on Cookman Avenue with my family, chatting with the gallery owners and other entrepreneurs down there. It was a great evening, with dinner and dessert and running into friends, visiting some of the more creative shops. Still, I couldn't help but notice, for the umpteenth time, the Asbury Park Chamber of Commerce slogan "Bought In!" pasted with bumperstickers on the glass storefronts. A vague feeling of nausea hits me every time I see this slogan. I'm a longtime homeowner here--"Bought In!" long before it became a catchphrase. But even so the slogan makes me squirm. Now, the Chamber of Commerce exists, of course, to cultivate the climate for growing wealth opportunities. I certainly don't mean to criticize that. And neither can I lay claim to any great business savvy. But even so, it seems to this lowly musician that if our slogans equate money with our level of commitment to our community, then what we will reap will be more of the same--the same culture of selfish greed that brought this town to its knees during its most difficult decades and has never completely subsided. A commitment to a community is not a commitment to make money, or a commitment to spend money. It's a commitment to people, a commitment to be active for the betterment of all the people. For some, a commitment to community doesn't even involve personal gain. Are those folks less "Bought In!" for never having spent a penny and expecting no dime in return? I can understand the impulse to make investment in Asbury Park attractive. But it seems that at the same time we've cheapened the appeal of the city. Reduced it to the level of pork bellies and copper--a commodity. In the end, of course, words are just words. The city's social and economic climate will be shaped more by people and actions than slogans. But still, "Bought In!" rankles. We're not a commodity. We’re a lovely little Shore city with lots of good people living here. We're a community. There was a typo in Ocean Grove's press release that was repeated in my Asbury Park Press column last week: Rossini's Stabat Mater will be performed 7:30 p.m. this coming Sunday, Aug. 30, not Aug. 23. Also on the program will be Mendelssohn's Second Symphony and his "Hebrides" Overture. The concert is in the Great Auditorium, Pilgrim and Ocean Pathways in Ocean Grove. For more information, call 732-775-0035 or visit www.oceangrove.org. this New York new music ensemble. The group performs a few times a year at Riverside Church, 91 Claremont Ave., New York City (north of W.120th St. and one block west of Broadway). The concert is free. On the program will be work by British composer Gavin Bryars, Japanese composer Somei Satoh, Austrian composer Kurt Schwertsik, and Americans Suzanne Farrin (pictured) and ensemble member Jonathan Faiman. Members of the Locrian for this performance are violinists Cal Wiersma and Curtis Macomber, violist Dan Panner, cellist Peter Seidenberg, bassist Troy Rinker, percussionist Eric Poland, pianist Faiman and harpist Anna Remersman. Directions and more information are available on the Locrian Chamber Players website. I have seen many fully professional productions that weren't as good as last night's "Sweeney Todd" at the Algonquin Arts Theater in Manasquan. Directed by Cynthia Meryl and starring a young cast of the New Jersey Youth Theatre both onstage and in the orchestra, the production was a wicked success. The actors, particularly leads Kevin Melendez and Jaclyn Ingoglia, are exciting, energized and enormously talented. It was clear for both that we're witnessing the birth of celebrated careers. One of the reasons I love this Sondheim musical is the complexity and inventiveness in the music. It's gorgeous, but also thorny and unpredictable. That also makes it one of the most difficult musicals out there, for the orchestra and the cast of singers. There were rare moments of weakness in the orchestra and in the singing voices of some of the cast on stage. If you weren't looking for them you would not have noticed. Mostly, the musical professionalism was staggering, particularly so given the young age of most of the players. The cast's ensemble numbers, like "God That's Good" that opens the second act, were especially effective. 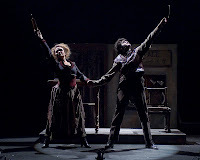 The opening "Ballad of Sweeney Todd" is reprised throughout the musical at key moments and each time with powerfully unified synchronization of voices, acting, lighting and staging. The hits of last night's performance, hands down, were delivered by Ingoglia as Mrs. Lovett with her song "The Worst Pies in London" and her duet with Melendez, "A Little Priest," both in Act I. At intermission, the audience was still laughing over her mad capering dance during "A Little Priest". But singling out those moments is an injustice to what is overall a very exciting, polished and compelling production. Tickets are still available for performances that continue through the weekend, 8 p.m. Friday, Aug. 7, and Saturday, Aug. 8, and 2 p.m. Sunday, Aug. 9. Algonquin is located at 173 Main St., Manasquan. Call 732-528-9211 for more information or visit the theater's website, www.algonquinarts.org. 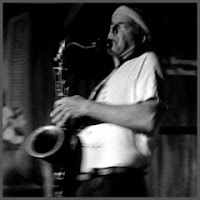 Wilbo Wright's experimental music series at Joe's Mill Hill Saloon, sponsored by Trenton Avant Garde Inc., continues tomorrow night, Wednesday, Aug. 5, with sax/bass/drums trio Jack Wright (pictured at left), Todd Capp and Andrew Lafkas, plus the Trenton premiere of Wilbo's improvisational instrumental opera, "Damthesnes" (pronounced "damn these knees"). The trio carves out a distinctive place in the free jazz tradition. 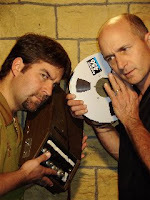 "Damthesnes" involves a truckload of instruments played by two people, Wilbo and Eric Haltmeier (Wilbo's the one on the right in the photo below). The story unfolds entirely in the music. As Wilbo points out, "no words, no singing and no bad acting." Wilbo performed this at the Black Box's Music of Invention series in Asbury Park a couple years ago. You can read about it in this Atlanticville article. Some of us have great associations with high school band. Others, not so great. On a good day, band builds social skills, cooperation and confidence in the student players and gives them an introduction to what it means to be part of a successful team. They make exciting, pulsing music and serve as the motor behind the magic of school spirit at games and ceremonies. On a bad day, band is a bunch of loser nerds made to endure regular humiliations at the hands of a Chief Loser Nerd of a teacher. To add insult to injury, sooner or later you don a silly hat and march around with your instrument on football field, anonymous comic relief parading around for the sport of a couple dozen much more manly and popular jocks and their doting parents. Obviously, a lot depends on the teacher and the subtle and not-so-subtle signals a administration sends to the band members and the community. More depends on them, in fact, than on the students themselves. The worst group of players can have the most positive experience if given the right support. Myself, I chose choir to get out of band. I'm not entirely sure my high school band experience would have been as terrible as I thought at the time. But for me it was both a professional and a social choice. I was a piano player and a guitar player in the days when guitar wasn't really considered a "serious" instrument. I was a rock 'n' roll fan and a Beethoven fan (that rock 'n' roll titan of the Classcial era) in an age when those seemed contradictory pursuits. I slammed the piano keys, even in the most gentle of Beethoven country dances, as if I were Jerry Lee Lewis. I dressed to offend. I was a rebel. With its odd uniforms, its Sousa marches and fraternity-style camaraderie, my high school band looked really hokey to me. Band was all about fitting in and I didn't want to fit in. Choir, by contrast, looked easy and maybe even compelling. The music was more arcane and exotic. The blend of voices had an almost magical appeal. I didn't have to take lessons on another instrument and I could wear a robe instead of a uniform (this was the height of Tolkein-mania and robes were pretty cool). Plus, I never had to march at football games. I went on to sing in choirs during my entire college training. Ironically, I became more and more fascinated with exactly those aspects that I had initially sought to reject--the work of cooperation and discipline, the slightly forced camaraderie and the social stew of rehearsals, performances and tours. Such choices are the stuff that professional careers and lives are made of. While I left off choral singing when I left college, my understanding of music from every respect is definitely colored by the experience. My choice of the piano as an instrument fits into this story. I knew I was defining who I was and who I wanted to be. But much of my choice was born out of compromise. I wanted to be a rock star and I couldn't afford to buy a bass like the one Paul McCartney played in the early Beatles records. We had a piano in the house. Plus, Beethoven was pretty cool and you couldn't really play that stuff on a bass. So I learned a handful of acoustic guitar techniques, to impress girls. And when the party was over, I would go back to the family piano for more private time with Beethoven, improvising long piano compositions in imitation of the great composer's sonatas. Could I have pursued the same tack while a member of the band? For many years I thought the answer was no. I assumed band was too stifling, too rigid, too much superficial ceremony and not enough opportunity for personal expression. But as an adult, it suddenly dawned on me that discipline was exactly what I needed. Plus, I see now that my rather undisciplined high school choir experience was more the product of a sleepy, disinterested choir director and not at all germane to the choir experience. Perhaps my choice of choir was entirely arbitrary. Perhaps it was born out of personal laziness. But in the end, I think it was the right one. Even now I am more compelled to find beauty in the flowing counterpoint and the characteristic colors of the massing of many voices, professional or amateur, than in the honking and stomping of even the best band. A personal prejudice that lingers to this day. The moral of this story: In the end, I was who I was and the music ensemble class I took in high school wasn't going to change that significantly. I had only to follow where my talents would make more most successful and make the best of any situation in which I found myself. But kids don't know that. They often choose for reasons that have nothing to do with what's best for them. They often make the wrong choice. And they often despair in situations that are not ideal, rather than plow ahead, demanding the education they need. For these jobs, they need adults--to encourage them to make the choice that honors who they are and at the same time challenges them to do better, and to guide them to rise above adverse or less-than-perfect circumstances.